MARITAL STATUS: Mathison and wife Vanessa made it official on July 27, 2002. CHILDREN: Lucas, born on April 20, 2003; Leila Emmanuelle, born on July 7, 2006. 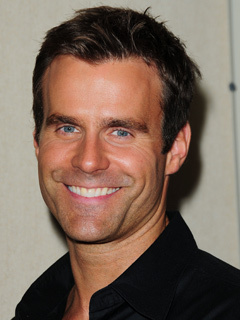 Canadian-born Cameron Mathison, the second of two sons born to Bill and Loretta, graduated from McGill University in Montreal with a degree in civil engineering. At McGill, Mathison was captain of the Redmen basketball team. Still an avid athlete, he is a golfer on the Celebrity Players Tour. Mathison joined AMC in 1998 and left in 2002 to pursue opportunities in Hollywood. A year later, with a new wife and son in tow, he decided to return to AMC, where his affable demeanor endears him to co-stars. Before he met and married his wife, Mathison was named one of America's 100 most eligible bachelors by People magazine. An avowed golf nut, the actor has hit the links with Josh Duhamel (ex-Leo), Jack Scalia (ex-Chris), Mark Consuelos (ex-Mateo), Aiden Turner (Aidan), Terri Ivens (ex-Simone) and Susan Lucci's (Erica) husband, Helmut Huber. Mathison's average golf handicap is 5. As an infant, Mathison was diagnosed with Legg-Perthes disease, a degenerative bone condition, and he wore corrective steel leg braces until he was 6. Appeared on the cover of Playgirl magazine in February 1999.